Even though it ended on a somewhat muted note, 2006 was still the best year for job creation in Washington in nearly a decade, according to figures released Tuesday by the state Employment Security Department. The state averaged nearly 2.87 million nonfarm payroll jobs last year, a gain of 3.2 percent, or 91,500 jobs, over 2005’s average. That was the most nonfarm jobs added in a year since 1997, when 98,600 were created. The year-end figures also show that 2006 conclusively marked the Puget Sound region’s full recovery, in terms of total jobs, from the dot-com collapse and subsequent recession of the early 2000s. The article included a nice graph showing the number of jobs in the four-county region since 2000. It has been well demonstrated in other markets that job growth or loss does not directly relate to home prices, but I thought it would be interesting to compare the Seattle Times graph with some data from the Seattle Bubble spreadsheet to see how well the more jobs = more demand = rising prices claim has held up in King County over the last five or six years. To obtain data about the number of jobs in King County I went to Workforce Explorer, the source cited in the Times article. First I present you with the graph that comes closest to supporting the view that jobs are the primary source of demand. 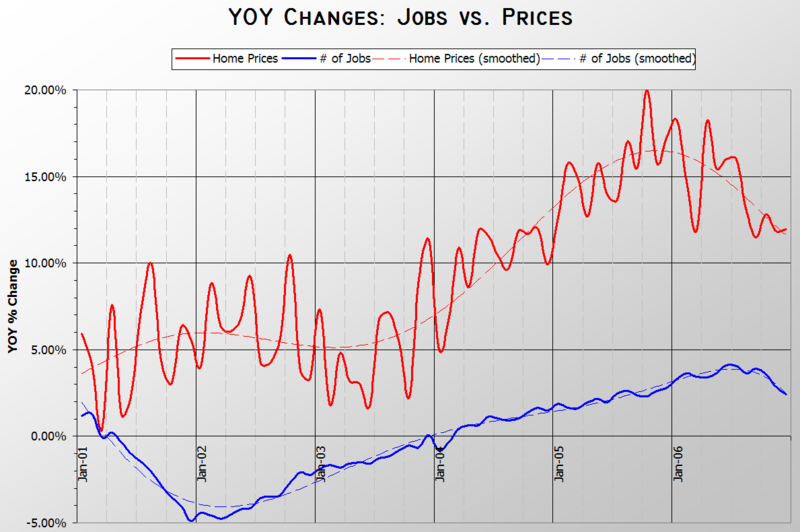 When you compare the percent change year-over-year in both the number of jobs and the median (residential only) home price, the curves actually almost line up, with both job and home price changes being increasingly positive from about early 2003 to the end of 2005. However, the total change in home price increases during that time went from +7.3% to +20.0%, while the total change in jobs went from -1.9% to +2.3%. Despite the similar curves, I think it would be difficult to argue that such a slight change in the job situation drove the major price increases seen over the same period. At the end of 2006 there were roughly 4% more jobs in King County than January 2000, yet home prices had increased a whopping 85%. I’d like to hear the logic that tries to argue that such a paltry increase in jobs will cause that large of a price increase in homes. Now let’s take a look at home sales. 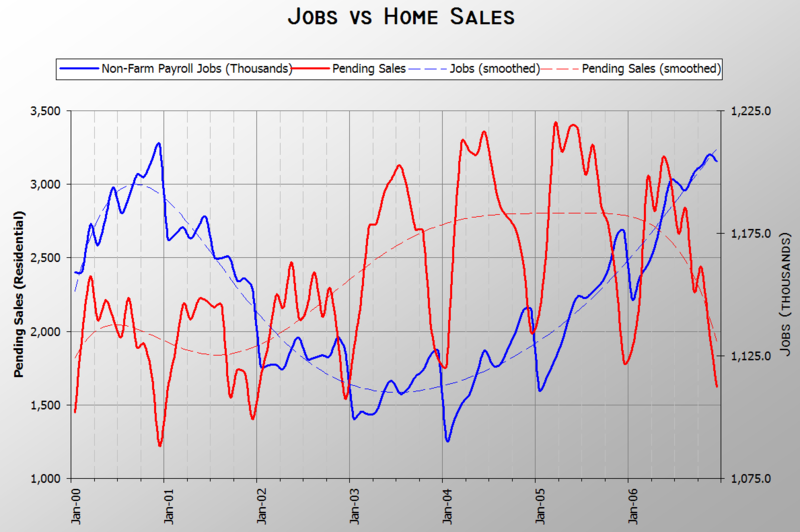 Supposedly the improving job situation is driving demand, and demand is measured by sales, so let’s see how the two compare. Hmm. 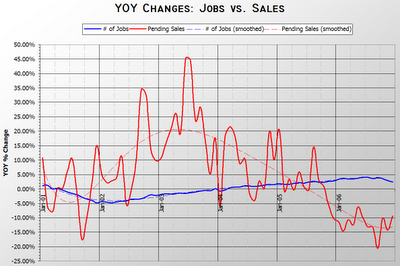 It would appear that sales were experiencing the strongest growth during a time when the number of jobs was actually declining. In the summer of 2003 sales were up by as much as 45% over 2002, and yet the job market was still declining by roughly 1.5%. 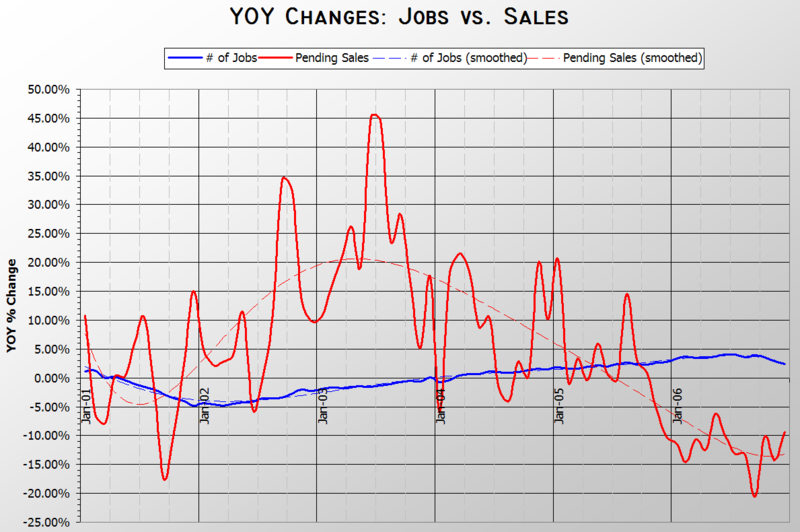 If jobs are supposed to drive demand, why is it that once the number of jobs began to increase in early 2004, sales actually leveled off? And why have sales been dropping off so steeply in the last year despite what the Times reports as “the best year for job creation in Washington in nearly a decade”? Could it be, perhaps, that the number of home sales and prices of sold homes in fact have very little to do with the number of jobs in a region? I challenge anyone out there that still believes more jobs = more demand = rising prices to show me the data that supports any sort of correlation between those data sets. Lacking that, I hope we can finally put this dead argument to rest. All of the above graphs—and the data behind them—can be downloaded in Excel format. Excellent work Tim! Unfortunately, most residents of “The Emerald City” don’t like having their tender noses rubbed in hard facts and will dismiss anything that challenges their Utopian view of the world. The real-estate party is over but these idiots will be the last ones to know. Of course job growth alone can hardly be expected to explain home prices, which are influenced by many factors — income growth, demographics, constraints on new construction and, perhaps most importantly, interest rates. Long-term mortgage rates generally ranged from 7 to 8 percent in the late 1990s, compared with 6 percent over the past several years. Negative job growth implies that some people are losing their jobs. Maybe people without jobs are more likely to flip properties to make money. More flippers increases demand and results in higher prices. The only thing that can sustain prices long term is income. How much income are these new jobs providing? Housing prices that are not supported at the base level of income will topple. Seattle real estate professionals and economists agree that the city’s job creation, relative lack of speculators and the fact that its boom never rose as high as other places kept its housing market healthy. We still have job growth and a shortage of lots here, so we have just not had a problem with standing inventory. Availability of jobs props up the housing market, and the job outlook for Western Washington continues to be extremely healthy. The purpose of this post was to point out that such claims are nothing more than hot air. 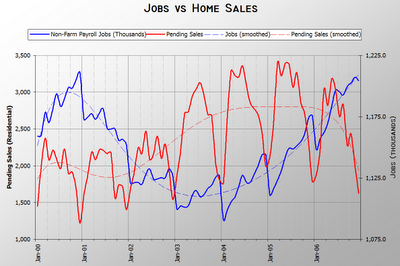 There is no evidence that shows more jobs = more home buying demand. 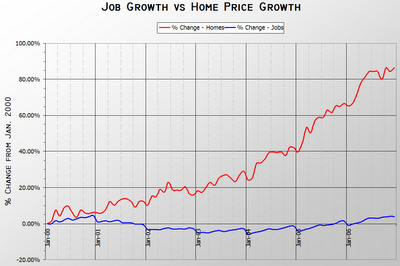 Not only does job growth not explain home prices on its own, it doesn’t explain home prices at all. Not even a little bit. Just the simple pearson correlation: is -0.42, meaning they are inversely correlated. 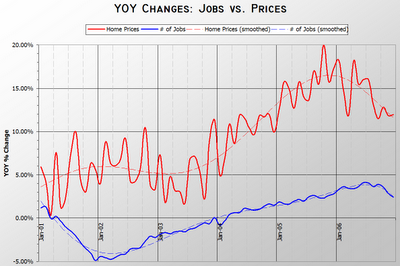 If you assume that there would be a 6 month lag between getting a job and buying a house the correlation is -0.12. Of you assume a year lag, you get a slightly positive 0.15 correlation. I currently live in San Diego. A year ago the prices weren’t going to go down here because we had solid job growth, or low unemployment, or whatever. What crap. Tim, There might not be “hard evidence” that more jobs are directly related to home buying demand, but common sense would tell you that a stong job market is good for local real estate and likewise a bad job market is bad for local real estate( detroit ). Its fine for journalists to use these common assumptions in their articles. I’m surprised you didn’t do your usual picking of quotes to take some cheap shot back at Tim or some other poster. As far as your “common sense” argument, that is about the weakest, most dense statement…I can’t even describe it. How can you say that after reading 6 months of your comments–as well as shug’s, trackbike’s (mia), financerugu, dalas (mia)–of demanding the “hard evidence” you so nonchalantly disregard. This whole housing market makes no “common sense.” kaleetan, it also takes a bit of common sense to realize that homes are not priced where they should be, and that people who are not able to afford a home, should not be tricked into utilizing shady financial tools to provide the false sense of ownership. How’s that for common sense? All this work to provide hard numbers for you, and all you do is say “duh, common sense?” What a joke. Its my new years resolution to be the a kinder gentler poster. I love the graphs it is great to see data busting market myths. 1. Do you have stats for the gap between average and median home values? 2. What % of the upper end of your market is custom built homes? 3. 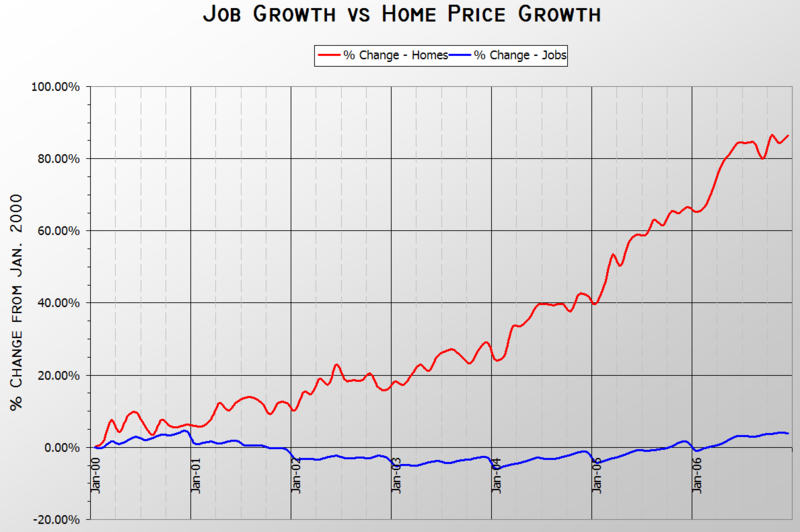 What do the graphs look like using average home values vs. job growth? 4. Why did you use pending sales vs. closed sales? The graphs are great! I think I am going to work up similar ones for my market.